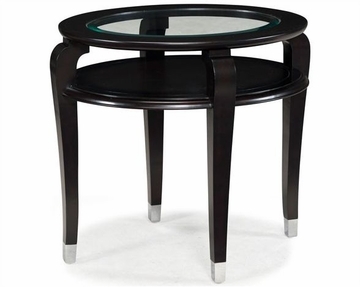 A great example of the transitional style, this oval end table brings the best of both the traditional design and modern style to your room. It is made of premium cherry veneer that flaunts a near ebonized black cherry finish – creating a regal effect reminiscent of the bygone era. The oval inlaid clear glass table top is in sync with the theme of the structure. The curved legs arch upwards to hold the oval shaped table top. The metal feet complete the look of this table.